All children in America ought to practice, for eventual memory recital, the Preamble to the United States Constitution. "We the people of the United States, in order to form a more perfect Union, establish Justice, insure domestic Tranquility, provide for a common Defence, promote the General Welfare, and secure the Blessings of Liberty to ourselves and our Posterity, do ordain and establish this Constitution of the United States of America." Now, while quite a mouthful, that sentence stands as a true wonder of declarative English. It demonstrates conclusively that persuasive writing consists largely in the quality of the verbs. Avoid wimpy passive-voice being verbs and substitute strong active verbs -- form, establish, insure, provide, promote, secure -- and you're well on your way to good English prose. Sure, you could cut that one into three sentences instead of one, but we’re still a work in progress. The verb “ordain” evidences something singular because it introduces the elevated framework. Instead of a cleric or a church, we ordain a civil way of life, purposed toward these good things: unity, justice, peace, welfare, liberty. These things are good for all mankind. But no one guarantees them. They are fleeting and inconclusive. Thus the humility undergirding the whole sentence: nothing presented is foreordained. We must ordain it, with our own lives and decisions. That’s our inheritance as Americans. “In order to” but no promises. It's great prose. And we should have the text ready at tip of the tongue. I have always wondered, though, whether the list of intentions were a bit of a laundry list rather than a coherent body of thought about what it is that the desired entity would be for. I should probably look up the debates about that wording. Does anybody know where to look? There are a huge number of features of the wording that have at least some philosophical or political consequences. For example, some aspects of the meaning of the words "We the people of the United States" depends on whether one takes "people...of (the several States, collectively)", or "people of (the new unitary thing that is a union of States)." There has surely been a lot of debate about that, though not necessarily in those terms. On the one hand the ratification required the consent of the several states, each state voting for or against on its own. (And some states did not become a member thereof until as late as 1791). On the other hand, "United" is capitalized, though taken on its own is just an adjective (which normally would not be capitalized), which clearly intends the reference to a single entity, the United States, as a cohesive body. It's complex. Did they actually think all that out, or was it partly accidental? Another is why they decided to 'establish' "this Constitution", rather than "the federal government of the United States". 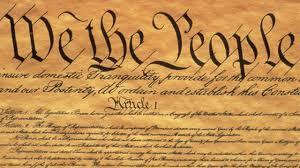 The Constitution is a document that describes the governmental order (and, to some extent, how to get there). It is not properly speaking an operative entity in its own right, it is (ideally) the form and structure of the government, which is the operative entity. I can still sing it to the tune provided by Schoolhouse Rock shown on Saturday mornings in the 1970's! Your point about "in order to" reminds me of a translation difference concerning a Bible verse. In the well-known King James, John 3:16 says "that whosoever believeth in him should not perish but have everlasting life." In the translation used in the 1928 Anglican liturgy (I haven't looked up precisely which translation it is) it says "to the end that all who believe in him should not perish but have everlasting life." My priest has argued that this difference disclaims any Calvinist idea of irresistible grace. I myself don't think that the KJV really conveys anything about predestination, since belief is still required, but "to the end that" certainly emphasizes the fact that man can resist the call. Similarly, America can fail to establish justice or secure the blessings of liberty to ourselves and our posterity. Or, you could just watch Captain Kirk recite it from the episode, "The Omega Glory," from the second season of Star Trek, TOS. I would post a video link, but that, probably violates copyright (copywrong?) laws.